The folks over at The King of Games are selling a 25th anniversary Legend of Zelda T-Shirt. The shirt, shown to your left, comes in four different colors. You can get it in white, off-white, turquoise, or navy blue, but other than color, each of the shirts are identical. They all feature sprite images from the original Legend of Zelda, such as pictures of Link, some of his item inventory, and enemy moblins wandering around. 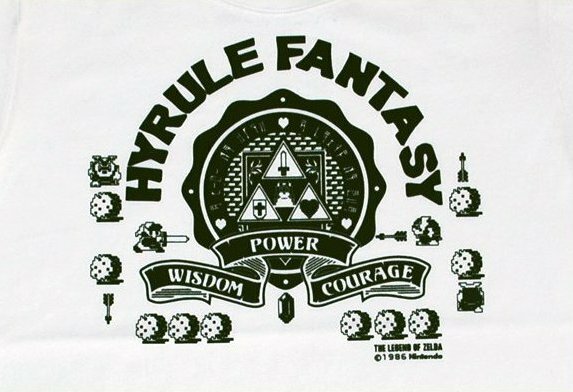 The words Hyrule Fantasy are printed across the top, as this was the Japanese name of the original Zelda title. Unfortunately the shirt is selling in Japan for 4900yen, which translates to $62 US dollars. Now I’m not sure if this is just the weak dollar, the shirts being totally overpriced, or a combination of both, but this is just a bit expensive. As much as I love collecting Zelda goodies, especially licensed material such as these shirts, this price value is just way too much. Even if it was half the price I’d say it would be too much. I think for a shirt like this, a price tag of $19.99 would be fairly reasonable. You can see a larger version of the art on the shirt after the jump. Despite the high price, what do you think of this shirt? If it was a reasonable price, would you buy it? Do you have any other Zelda related t-shirts? Let us know by posting in the comments below.